It doesn’t rain often in Arizona, but when it does it can have lasting impact. Wenden is a small community west of Phoenix. Most of the people who live there are either farm workers or working class retirees. It’s the sort of town most of the people who live in Phoenix or Tucson never see or think about it. Wenden has the bad luck of sitting on the west side of the Centennial Wash, a normally dry river bed. Centennial Wash is supposed to be a relief valve of sorts and carry flood water to the Gila River, which empties into the Colorado River and Sea of Cortez. Problem is, the Centennial Wash is choked with vegetation near Wenden. So when the wash runs it overflows its banks and spills into the tiny town no one thinks about. Wenden is right on the west edge of the wash. The wash doesn’t have a deep channel like a normal river bed, in fact it’s about the same level as the town. So if water can’t get through the wash it follows the path of least resistance right into Wenden. 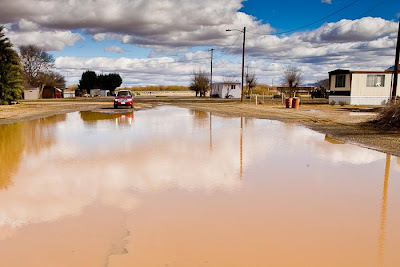 It started raining Thursday afternoon and by Thursday night the water was coursing through town. The residents were evacuated to nearby Salome and on Saturday were still waiting to hear when they could go home. The first time I was in Wenden was in 2000 when the town was practically washed away in a flood. Eight people were swept from their homes and never seen again. At the time, the experts said this was a once in 100 year event. I was back in Wenden today, less than 10 years after the first flood, to photograph its second "100 year" event. 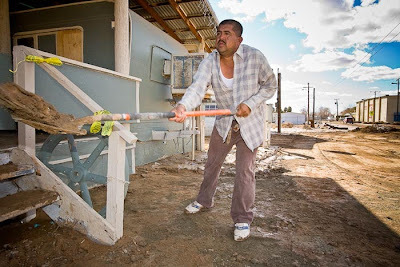 Talking to the farmworkers and retirees who struggle to keep their town going, I can’t help but wonder if the Centennial Wash cut through Scottsdale or Paradise Valley how quickly the brush would have been cut from the river bottom. 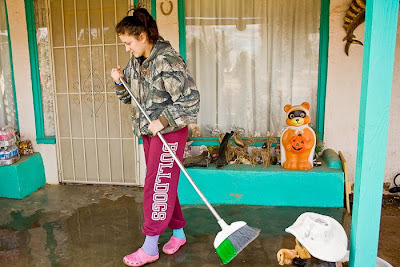 The photos: A flooded street in Wenden, a farmworkers cleans the mud away from his mobile home, a girl cleans the mud away from her grandparents’ home and a woman in a shelter changes her daughter’s diaper. There are more photos from Wenden in my PhotoShelter archive.